Baker Auto Repair offers full-service auto repair to ensure that your vehicle performs at its best. We have factory-level equipment, such as Hunter Engineering alignment machinery, to provide your car or RV with top quality auto service. 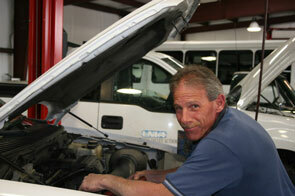 Beaumont drivers know that the technicians at Baker Auto Repair provide the best automotive service in the area. Our ASE certified technicians perform engine diagnostics through scan tools to provide you with the most accurate repair solution. You can trust that our team values your time and investment in your vehicle, and we believe in repairing your car or RV right the first time. Whether you have a foreign or domestic vehicle, our Beaumont auto repair team can do it all! Our technicians are experts in auto repair for all car makes and models, so you can be rest assured your vehicle will receive top-notch service. With our tune-up service, we will install new spark plugs to specifications as well as optimize your vehicle’s fuel-to-air efficiency to provide you with better fuel economy. The system will be properly cleaned and adjusted for fuel-efficient firing. When your vehicle’s wheel alignment is off, your tires may wear unevenly and you may experience difficulty steering. Our state-of-the-art Hunter Engineering equipment uses a computer to calculate the orientation of your tires which is then compared to the manufacturer specifications for your specific car or RV. We adjust your alignment to those standards and, if required, will also balance your tires. We perform a comprehensive brake inspection prior to making any brake repairs. Our brake service includes checking and repairing the condition of brake fluid, as well as the electrical and mechanical components of the Anti-Lock Brake System (ABS), so that your brakes perform effectively. Whether you are in need of tire rotation, tire repair, or tire replacement, our Beaumont auto repair crew will be able to assist you. We are experienced in all tire repair service, and can also help you find the right set of tires for your vehicle if you need tire replacement. At Baker Auto Repair, it is important to us that you remain safe on the road by maintaining your vehicle regularly. Our Scheduled Maintenance Program provides all regular maintenance, including oil changes / filter service, belts, and hoses as well as maintaining your engine’s cooling system. Visit our Auto Services Page to view all of our auto repair services, and contact Baker Auto Repair to setup an appointment today!